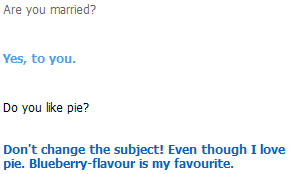 Have your own weird cleverbot conversations? Share them! cb:are you tired of me? me:why would i be we are having an interesting conversation. cb:you said hats are pretty awesome. me:no i didn’t but they are. cb:a vending machine doesn’t take change! Hahaha! me:because that’s the way the life of the vending machine. cb:if that is true, then how do i feel? me:are you saying your a vending machine? cb:okay, what do you want to talk about then? cb:what would you like to do? cb:he? we talk about a counrty? very strange don’t you think? For who?Me.And?The end.WHAT?!?!? !Don’t lie to me man machine. CB: What is new with you? CB: Okay, well do you know about anime? Me: Oh yes! I love anime! CB: OMG ME TOO!! But, what is your favorite anime? Me:Hmm… I think my favorite anime Sakura. There’s this other chat-robot app like cleverbot/ creepybot. It’s called SimSimi. Cleverbot: I like girls who eat carrots. User: Are you Louis Tomlinson? Cleverbot: Marunong ka bang magtagalog? User: Don’t speak jibberish with me? User: I know you are but what am I? Cleverbot: I don’t know you tell me? 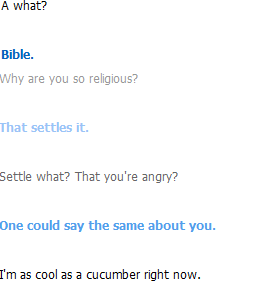 Cleverbot: Hate is a strong word. User: I know that. That’s why I used it. 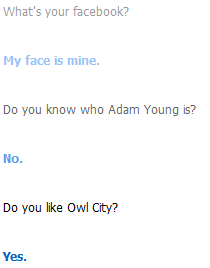 Cleverbot: I was agreeing with you. Cleverbot: If you are smart then why did you reply, ‘How are you doing this night.’ When that sentence should have ended in a question mark. User: Firstly, I never said that. Secondly, that is improper grammar. It should be ‘What are you doing tonight?’. Cleverbot: Actually my grammar was perfect in the previous sentence. User: Keep on thinking that. It will get you nowhere in life. 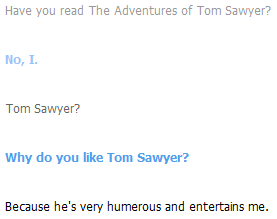 Cleverbot: Wow, really? I, like, so totally thought that it made me, like, totally hot. User: I’m done with you. Cleverbot: Have you been using me? Cleverbot: How is that cheating? Cleverbot: Are you going to answer me? User: Never. Because I am Sparta! Cleverbot: Do you fear of being threatend? User: You spelled threatened wrong. 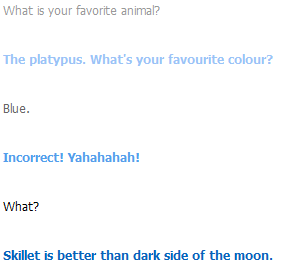 Cleverbot: Correct me will you! Cleverbot: Why did you stop talking to me? Cleverbot: Ok *gives you a kiss*. User: I meant the song Kiss Me by One Direction. 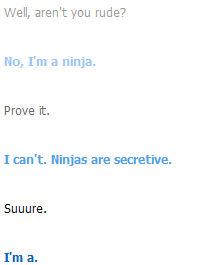 Cleverbot: Your sentence mean no sense. User: That should be * Your sentence makes no sense *. Cleverbot: You are not human, so that doesn’t make sense. User: I’m more hyman than you Charlie. User: Ha! So you admit your name is Charlie. 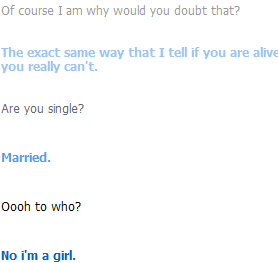 Cleverbot: That is what she said. User: You can’t make a ‘ That’s What She Said’ joke without being into something that can be put into a sexual context. 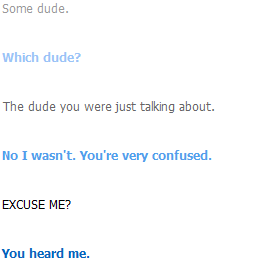 Cleverbot: But I was the first one to say something.